You will love all the amenities and the mountain views from each of the 3 decks in this wonderful cabin in the Smoky Mountains! Bearly Escape features 4 Master Suites each with a king-size log bed and Jacuzzi Tub for Two with adjoining full bath, TV & view of the mountains. Enjoy the view from inside or step out onto the deck to be surrounded by stunning scenery. Bearly Escape is located on a hill just 2 miles off the Scenic Highway (called the Spur) 1.5 mi from Pigeon Forge and 3 miles from the heart of Gatlinburg. You have easy access to all the outlet stores, restaurants & entertainment venues that the area has to offer, and with a short drive back to the cabin you will be away from the noise. Even Townsend, Sugerland Visitor’s Center, Cades Cove & The Smoky Mountain National Forest are a short drive away. Further Details: The open floor plan features 2 levels with 3 covered decks. You will love the giant hot tub, fire place, pool table, board games, Play Station 3 with games ,Stand up Arcade Game with 60 of your favorite video games from the 80's & wet bar. Hi-speed wireless internet and cable TV is throughout the entire cabin! 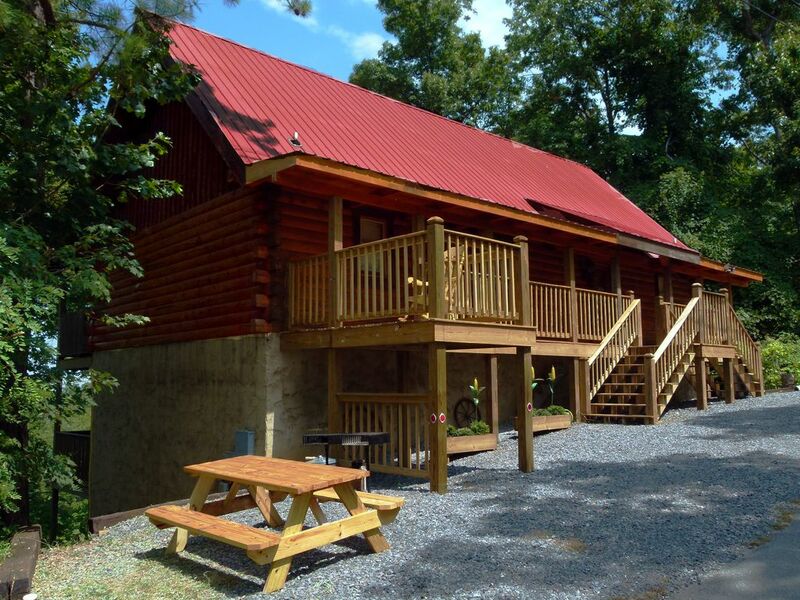 'Bearly Escape' has all the conveniences of home PLUS the Beautiful Smoky Mountains! About The Owner: My name is Bill and my wife's name is Liliane. I am from South Florida and Liliane is from Switzerland. Liliane speaks English, German, French and a little Spanish, I speak good old American....LOL. We love the outdoors and all that goes with it. We visited one of our friends cabins in the Smoky Mountains and we fell in love with the area. We could hike on any of the 300 miles of trails, go white water rafting on the Pigeon River or just kayak on any of the rivers in the area. My wife loves skiing and with Ober Gatlinburg just a few minutes away she can go skiing while I stick to tubing (remember I am a Florida boy). Even in the spring, summer and fall there are things to do there. We have just begun to explore this wonderful area, but have already found our Little Piece of Heaven and we want to share it with you. Come and enjoy, you too will fall in love. Please enjoy our cabin, but make sure you visit the wonderful sights and entertainment that the Smoky Mountains have to offer, like white water rafting, kayaking, hiking, skiing, tubing on snow and rivers, and the shows in town. Whatever you do, just relax and enjoy our cabin. Liliane is from Switzerland, and I was born and raised in South Florida. Since we have been together life has become very exciting. We zip line from mountain to mountain at 40 mph, spent time in the Andes, the Amazon, Costa Rica, Germany and Switzerland. Liliane is an avid hiker and loves the outdoors. I on the other hand make one heck of a base camper for her to come back to..LOL. But, together we love whitewater rafting, kayaking, camping, bird watching or just have a meal together and talk about what adventure we will go next. But one of our favorite place are the Smoky Mountains. That brings us to the reason we got our cabin Bearly Escape; to have a place to stay whenever we visit the area or bring friends and family along. And no one has to feel like someone else got the "better room" as all 4 Master Suites have the same amenities. They all come with king beds, a in-room Jacuzzi tub for quiet times and a full bathroom. It has a perfect location to get to all of the things we want to do, 350 miles of hiking trails, white water on the Pigeon River, creeks and rivers for fly fishing, great motorcycle riding, and if the weather is cooperating we equipped to keep us busy having fun at home. The cabin is on the scenic highway between both great destinations (:1.5 miles from Pigeon Forge and 3 miles from Gatlinburg :) Even when the area is busy, you are closer to where you want to be and not sitting in traffic wanting to be there. Also just take a look at how the cabin is equipped, it is meant to give you the real log cabin experience with a touch of luxury. Each King Bedroom Suite has its own Jacuzzi for 2 next to the bed and it's own full bathroom with door. High Quality Bath Sheets/ we even provide disposable wash cloths for makeup removal and other things. Ash cans will be provided on the decks outside, Please do not throw un-lit or lit butts of the decks.Minimum Age Limit for Renters: 25 years of age or older, Kid Friendly: Each Bedroom has a jacuzzi, Please do not leave children unattended. Pets considered ASK: At this time, please check back at a later date. Broadband Internet: Up to 12 MPS download speeds, Telephone: Local Calls, Mountain View: North View, Deck/Patio: 1 New Covered Front Deck with scenic 'Look Out' and 2 Covered Rear Decks (with mountain view), Charcoal BBQ Grill: Outside, you supply charcoal and fluid New 4 burner gass grill, Full Kitchen: All New Appliances, Dishes, Silverware, glasses, Cooking Utensils, Appliances Provided: All New, Private Hot Tub: Outside on Lower Deck, Video Game Console: Play Station III /Blue Ray DVD Player, Video Games: All Sports related- Bring any favorites, Gas Fireplace: Electric during Spring and Summer, Washer/Dryer: Stackable, Air Conditioning: 2 zone, Linens Provided: New. Very nice rental and owners! Thankful for the beauty of the mountains and for time spent with family. This cabin was wonderful for 10 people and great for families! We had a great time showing the kids a part of the country that we’ve fallen in love with. And the cabin was a welcome retreat at the end of each day. Well appointed with everything we could need and plenty of options for entertainment. Our hosts were incredibly sweet and helpful, too. Perfect stay for families or couples! We very much enjoyed the pool table downstairs and the views everywhere! Rooms are spacious and had their own bathroom. The drive was paved but very very steep. That was my only concern was the steepness. Everything else was perfect, clean, and beautiful. Also Bill is the perfect host! Very informative and funny! This cabin is amazing. Every amenity we could ever want. It’s tucked out of the way yet close to everything. We had the most refreshing week of adventure and this cabin was the icing on the cake. Will certainly be back. We came from South Carolina and met with my brother and his family from Indiana. The cabin was amazing, we had everything we needed for our evenings of cooking in and enjoying family time!! The bedrooms were so comfortable and roomy, loved the jacuzzie tubs in each room. I cannot say enough about Bill the owner...he was so helpful and pleasant even when I had to call him a couple of times. We are looking forward to our next visit to Bearly escape as we all loved it and the fact that the owner really cared about our stay made it even better. Loved it. The view the property. Beautiful. Log, cabin, 4 bedrooms, 4 bathrooms, sleeps 10 to 12, View, paved roads, Pigeon Forge, Gatlinburg, Dollywood, hot tub, 4 jacuzzi, Arts District, Cades Cove, Smoky Mountains, Ober Gatlinburg, skiing, white water rafting, golf, deck, fishing, bears, deer, wildlife, bird watching, hiking, waterfalls, rivers, fireplace. 1.5 Miles to Pigeon Forge, 3 miles to Gatlinburg.. Golf: Avid fans know that golfing isn't just a sport, it's a way of life! While in Gatlinburg and the Smokies, indulge in your favorite pastime at the area's most uniquely designed course. From the challenging layout and emerald fairways to beautifully wooded landscapes and well-manicured greens, you'll remember this picturesque setting in the heart of the Great Smoky Mountains. In prime condition after a half-million dollar renovation to several holes during 2007, Gatlinburg course provides unique golfing excitement in a spectacular mountain setting. Gatlinburg Golf Course is open year-round with modern facilities, fully equipped pro shop and food services area. This beautiful 18-hole course was designed by noted golf course architect William Langford. In 1993 and again in 2007, it underwent major renovations by Bob Cupp & Associates of Atlanta. Today, the completely rebuilt greens and reworked fairways are better than ever. The course offers the well-seasoned golfer as well as the beginner a challenge on every hole, while its scenic beauty is unsurpassed. The course has been acclaimed as one of the most picturesque courses in America with breathtaking views of the Great Smoky Mountains. Located just five miles from downtown Gatlinburg, the course lies adjacent to Dollywood. Convention and group outings are welcome. Call us – we'll have a tee time waiting for you! Play our legendary #12, affectionately known as 'Sky Hi.' It's 194 yards in length and drops 200 feet, tee to green, making it one of the most dramatic holes in the country. The #3, 529-yard par 5 we call 'Long Lane,' and for good reason! And #17, a 231-yard par 3, offers little in the way of forgiveness. All together, it’s 6,281 yards of challenge and fun. Ski: Welcome to the scenic and exciting four-seasons world of Ober Gatlinburg Ski Resort and Amusement Park, high above Gatlinburg, Tennessee! A mountaintop of fun, excitement, and mountain beauty is waiting for you. ***2nd Pet $50.00 + tax charge*** Pet Policy: NO PETS ON BEDS OR FURNITURE. You will be charged for the extra cleaning up to $250.00 if the beds and furniture has pet hair on them. Please bring pet bedding, food dishes and creates with you. Please remember we allow your pets into our home.